after Dalby House and Dr. Norman and…. …. (Leaving High Street we pass) on our right the old Unitarian Chapel. The Unitarian Chapel was one of the oldest, if not the very oldest in the town —I believe it was a Presbyterian Church prior to being a Unitarian. It had large box pews, and it was in one of these that Miss Walls lived, when she had to leave her tiny cottage in Burr Lane, where she kept a small school. On Sunday, April 9th 1922 a service was held at the Unitarian Chapel in Ilkeston to celebrate the 230th anniversary of that chapel and to remember ‘those who long ago built the original venerable house’. The sentiments of the ‘not large’ congregation were reflected in the words of their hymn…. In heaven are kept their grateful vows, Their dust endears the sod. And prayers of tender hope have spread, A perfume through the place. Evidence would suggest that the original ‘venerable house’ was not a purpose-built place of worship but rather a domestic dwelling, registered as a place of worship. Adeline makes mention of a ‘Presbyterian Church’ and there is reference to ‘a little Presbyterian community which had met in Hannah Carrier’s thatched cottage’ in 1692. This followed the Act of Toleration of 1689 when, on January 10th 1693 this cottage was registered as a Presbyterian meeting house. 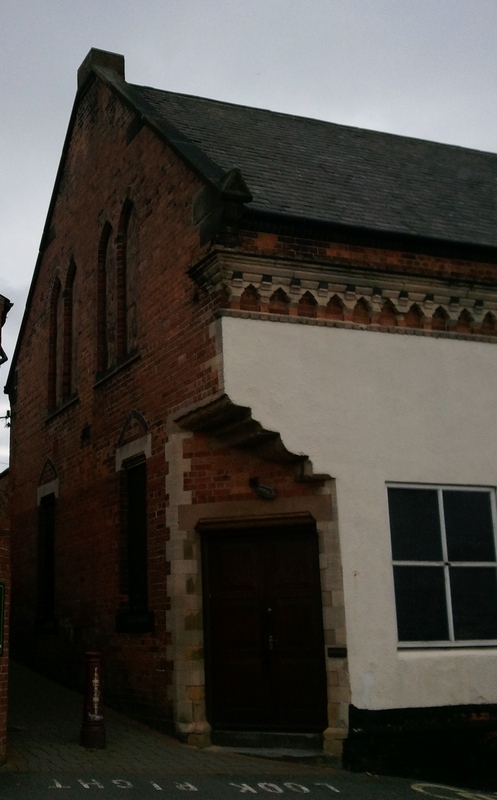 In 1718 the first chapel was built at Ilkeston (Trueman and Marston). At Ilkeston’s Manor Court in that year, husband and wife William and Miriam Richards, with Hannah Carrier, gave up 14 yards of a garden at the corner of Gipsy Lane (Anchor Row) and another lane to eight people ‘for the purposes of erecting a Chappell or Meeting house for a Society, Congregation, or Assembly of Presbyterian Dissenters from the Church of England’. The site was at the corner of Anchor Row and High Street. Frank Burrows, a Bath Street bookseller and stationer, contributed a series of articles to the Ilkeston Pioneer in 1907, which contained an account of the history of the High Street Chapel and its ministers…. “So far as is known, no print or photograph of the venerable old structure exists. It must have been a quaint little place. It ran north and south, and had a roughly made gallery at one end”. The stairs up to this gallery were “very creaky and not at all strong, and a false step might have meant a break down. The entrance was from a small graveyard on the west side. The pews were of the old fashioned high-backed type, suggestive of sleepiness. Over the fine oak pulpit was a carved sounding board. The singing was supported by instrumental music, violins, ’cello, flute and double bass. …. The ceiling was supported on roughly trimmed timber, and the chapel was white-washed. A triple lancet window faced Dalby House”. For most of the first half of the nineteenth century the Rev. Mark Whitehouse was minister at the church (1819-1856). “He was a man who loved a country life, and in appearance was more of a farmer than a minister. Clad in blue smock, and wearing on his head a white hat with a black band on it, he rode regularly into the town on alternate Sundays”. (Frank Burrows). It was Mark who supplied the statistics for the national Religious Census of 1851 which showed a Sunday afternoon congregation at the chapel of about 10 to 12 persons in total. The total accommodation was 100 free places. Mark’s death in 1856 led to the closure of the chapel until 1859, when the Rev. Thomas Read Elliott arrived for a two-year stay. Mark’s death also led to an unsavoury dispute among some members of the chapel’s community. The chapel keys were retained by the caretaker, William Mellor, who now regarded himself as its new owner and he took it upon himself to secure the building with a large padlock. His claim to ownership rested upon the fact that he and his ancestors had for many a year cleaned and taken care of the place!! Needless to say the would-be worshippers at the chapel were a little peeved and had to break into the building with the help of George Small, the parish constable. A legal tug-of-war ensued, with claim and counter-claim, but the magistrates refused to interfere. They did however suggest that Mr. Mellor should return the bible, hymnbooks, cushion and clock which it was claimed he had removed from the chapel. It seems that this argument caused some discussion in parts of the town and led to William Mellor’s sister, Elizabeth, appearing at Smalley Petty Sessions, accused of assaulting Thomas Worcester Barker, lacemaker and house agent of Albion Place. She had taken exception to ‘lies’ that Thomas was spreading about her brother and had been provoked to attack him. The old chapel was taken down in 1867. “The chapel was originally attended by the leading families of the town and district” but numbers had much declined up to the 1860’s. When the foundations were removed the local newspapers reported that this revealed the much-decayed bones of an adult person, though no-one could recall anyone ever being buried inside the chapel. On one of the pillars supporting the gallery were the figures 1719, supposedly the date when the gallery was erected and not when the chapel was built. The Rev. William Shakspeare had arrived in Ilkeston from Crich in 1862 and under him a new, larger Unitarian chapel, designed by William Warner, was erected and opened on October 14th, 1869 over the site of the old one. The small graveyard there was lost along with tombstones, the human remains being transferred to St. Mary’s graveyard. “No care seems to have been taken to preserve a record of the inscriptions on the tombstones”. This register is now kept at the National Archives though a copy is held at Derbyshire’s Record Office in Matlock. 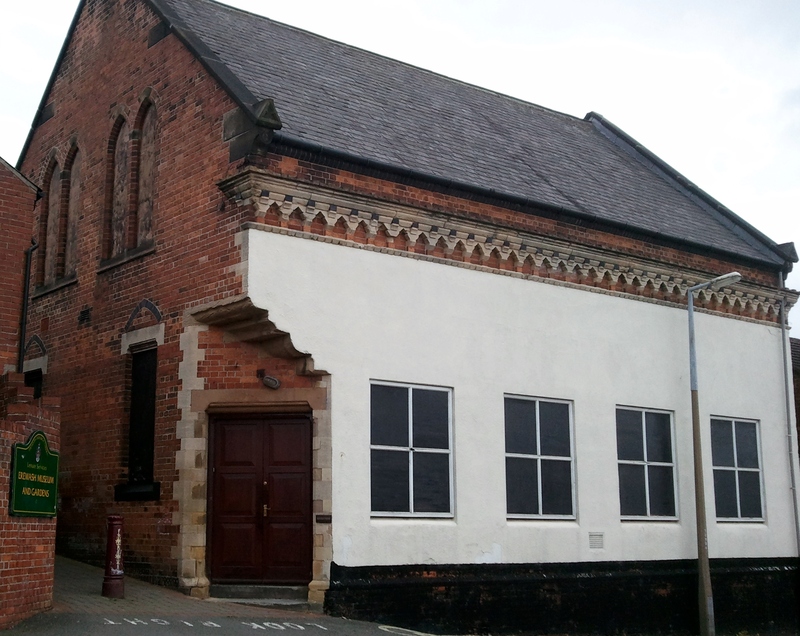 According to the Ilkeston Telegraph of September 1873, the funeral service of John Swanwick of Springfield Terrace, son of lace manufacturer George, was the first ever held in the New Meeting House in High Street. The Rev. William Shakspeare’s wife, Anne (nee Attenborough) was the daughter of Joseph and Ann(nee Buckland) of Gilt Briggs Farm, Kimberley. She was the chapel organist and with her husband ran a night school at the chapel for a good number of years. Their eldest son, also called William, eventually replaced his mother at the chapel organ when old enough, and helped his parents at the night school, well into the 1870‘s — until a series of Education Acts changed the nature of elementary education in England and ultimately did away with the need for evening schools. William senior served as minister from February 1862 until his retirement in 1887. William junior was on the staff of the newly-formed Ilkeston Advertiser in 1881and later was its editor and proprietor. Brother of William senior was James Shakspeare who took over the printing and publishing of the Ilkeston Telegraph in the spring of 1870 while the previous proprietor, Frederic Lomas, left for ’Bank Chambers’ in the Market Place, Nottingham. And within months the brothers Shakspeare were embroiled in a libel case with arch rival John Wombell. Handbills had been posted and circulated around town, headed ‘Notice Zachary’ and suggesting improper conduct between the editor of the Pioneer and a young lady who had spent a short stay in the Wombell household — not the first time that John had been accused of impropriety!! John vehemently denied the accusations and proved that the printing presses of the Shakspeares had been used to produce the offending material. In March 1871 the libel case moved from the Petty Sessions to the Spring Assizes at Derby where John believed ‘a verdict against the Shakspeares was certain and that it would be ruinous to the defendants, particularly the preacher’. He had no wish to see either of them in prison and nor did he seek damages. Thus he accepted their apology in court plus £25 towards his costs. No evidence was subsequently offered and the brothers were discharged, a verdict of ‘not guilty’ being recorded. In 1893 the chapel was registered for marriages. In March of that year the first wedding to be solemnised there was between coalminer and widower Moses Straw and Mary Ann Fisher, ‘the nuptial knot being tied by Mr. G.D. Hughes of Nottingham High Pavement Church, in the presence of numerous friends’. In commemoration of the event the newly wed couple were presented with a Bible. Born in 1868 Moses was the first of the several illegitimate children of Charlotte Straw and her second cousin, coalminer Thomas Straw, who later married in 1878. Moses and Mary Ann regulated their lives together at 34 Wood Street for nigh on 50 years. And so we come to Anchor Row. The entrance to Anchor Row from High Street. Out of view, on the left, is Dalby House, home to Erewash Museum.